An interesting feature of Corieltavi coinage in the first century AD is that it was regularly struck by two rulers at once, and at one time by three, all of whom were apparently colleagues. This suggests that the 'joined tribes' which formed the Corieltavi confederation still had their own kings who worked together for the good of their combined peoples. The four kings of the Cantii of 55 BC may have been working within a very similar system. The tribe's name was traditionally thought to be Coritani, thanks to Ptolemy's Geography. However, other sources indicate that Corieltavi (or Corieltauvi) is the more accurate term. Consonant shifts in Celtic languages repeat themselves. One of these shifts was 'm' to 'v', as in Dumnonii to Devni (Devon). If it can be accepted that the Romans couldn't get their name right (after all they called the island and the people Britain, not Pretain), then Coritani could have been Coritami, but the 'l' was lost in the same manner as the Damnonian Alt Clut / Attacotti name shift. Corieltavi would have been Corieltami before the shift in the consonant. The first element of both versions of the tribe's name is 'corio-', the Brythonic word for 'army' from the proto-Celtic 'korjo-', meaning 'army'. Interestingly, both spellings of the tribal name shown above would appear to be incorrect, even though 'Corieltavi' has been used more recently to replace the perceived inaccuracy of 'Coritani'. It seems more likely that the name should be Coriotani or Coriotauvi. The second element is interesting in the second form because 'u' and 'v' both have the same form in Latin, which uses a 'v', and using both here implies that the second of them is pronounced as a 'v' instead of a 'w' (which is how a Latin 'v' would normally be pronounced). This then supports the idea that an 'm' may have become a 'v' sound. The second element is still opaque. Is it related to modern Welsh 'dwndwr', the second element of which means a 'din, babble, hubbub', from the proto-Celtic 'durdo-'? Were the Corieltavi the 'loud army'? Pronunciation of the Corieltavi name can be broken down into five segments - kor-ee-el-taa-we - with each letter vocalised and with a mild emphasis on the emboldened letters. The Coriotauvi name is similar - kor-ee-o-taa-we - again with a mild emphasis on the emboldened letters, and with the 'a' in 'taw' as in 'apple', not 'law'. One thing to remember is that if a Roman recorded a name, a 'v' is pronounced as a 'w', although this seems largely to be ignored with the Corieltavi. 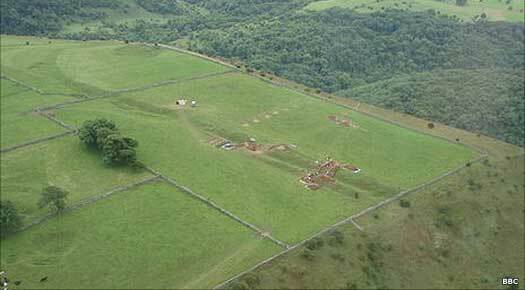 An archaeological discovery in 2011 at a hill fort in Derbyshire suggests warfare in the area. Derbyshire is on the northern edges of Corieltavi territory, bordering the Brigantes, although it unlikely that these tribal associates even exist in this form at this time. The hill fort at Fin Cop in the Peak District is apparently under construction in this period as a response to a very real local threat. The fort has not been completed when it is attacked and destroyed and its inhabitants massacred. The bodies of the women and children are buried in the fort's ditch which is then filled with the rubble from a stone wall. Animal bones also found in the ditch include horses, which suggests some high status inhabitants in the fort. Although the site has been occupied since the fifth millennium BC, the hill fort of Burrough Hill begins its most intensive phase of occupation around this time, which lasts until around the time of the Roman invasion of AD 43. Burrough Hill is eleven kilometres (seven miles) to the south of Melton Mowbray in Leicestershire, in the East Midlands, well inside Corieltavi territory at this time. In 2014, the University of Leicester announces that it has uncovered the remains of a chariot burial on the hill, an extremely rare find outside of the territory of the Parisi in East Yorkshire. The burial dates from the third or second century BC and the chariot is either dismantled, or has never been assembled. It most likely signifies the passing of a high-status individual, and seems to suggest a level of influence from the culturally equal Parisi - possibly intermarriage and a mixing of customs, to expound just one theory. The only information regarding the rulers of the Corieltavi comes from coin discoveries. Between 80-50 BC the earliest coins are produced, based on Gallo-Belgic staters that have been in circulation for a while. 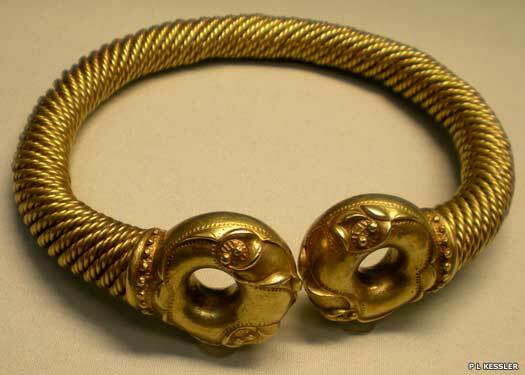 They have equestrian designs on them (the horse is a valuable commodity), but no inscriptions. Silver coins first appear in 50 BC, also with horse designs on the rear, or reverse, no inscriptions, and with a boar on the obverse. Another, chance find of coins is made in 2013/2014 and is confirmed by archaeologists as being significant. The twenty-six coins include gold and silver British examples alongside three Romans coins, the first time a mixed horde of this nature has been discovered. 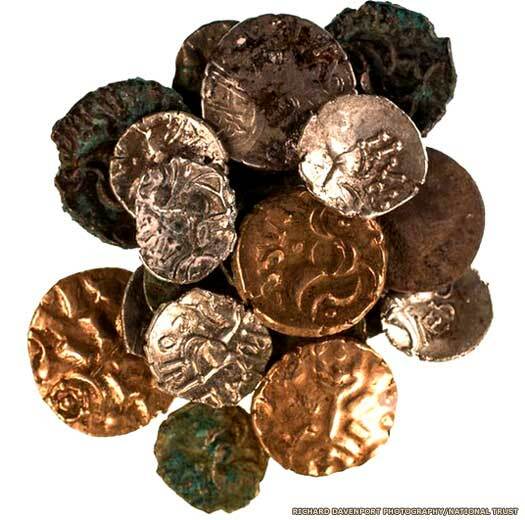 The Roman coins are dated to a time shortly before their invasion of Britain, but the entire horde seems to have been buried around the time of the invasion. The find is made at Reynard's Kitchen Cave in Dovedale, in the Peak District, which is right on the very edge of presumed Corieltavi territory. The first inscriptions appear at the start of the first century AD, but the names are so abbreviated as to be indecipherable. These are shown in capitals, with no attempt being made to turn the inscription into a possible name. The earliest names are paired, suggesting a dual kingship, or two kings ruling equally and united. Probably the same ruler as the previous VEP, but now alone. Overall ruler of the Corieltavi or simply chief of a council of kings? Sub-king? May be the DVMNO of c.40. Sub-king? (Not the same as the king of the Trinovantes & Cantii). Following their invasion of south-eastern Britain and their swift conquests there, the Romans under Governor Aulus Plautius are apparently welcomed once they reach Corieltavi territory, although perhaps some persuasion is needed initially. Two large hoards of coins bearing the name Volisios are later found in Lightcliffe and Honley in South Yorkshire, suggesting that some of the nobility head to the north of the territory upon the first arrival of the Romans. It is also possible that Volisios moves his camp into Parisi territory and remains there for some years after the Roman capture of the Corieltavi territory. Was it the Roman invasion of Britain and the rapid progress of Roman troops towards the territory of the Corieltavi that made someone panic and hide their wealth in Reynard's Kitchen in the Peak District? However, there is some fighting within the tribe's territory. Whether it is by the Corieltavi themselves or by other Britons who enter from elsewhere is unclear, but they take refuge in the woods of the Axeholme and Mission areas (immediately to the south-west of modern Scunthorpe). The Romans burn down the woods. The principle Corieltavi settlement at Ratae Corieltauvorum (modern Leicester) is captured and the IX Hispania Legion is assigned as the garrisoning force (although the location of the fort is yet to be unearthed). The Corieltavi submit to Rome, and the tribe's kings become Romano-British land owners. The Roman presence in the region is useful as it helps to deter raids by the Brigantes. The region forms Rome's northern border in Britain, with the unruly Brigantes beyond it not being conquered until AD 79. Another fort is established at Lindum (modern Lincoln), perhaps by AD 60. During this period the first Roman citizen colony in Britain is established at Lindum (modern Lincoln), in the far eastern section of Corieltavi territory. The name is possibly a Latin version of two Celtic words, 'linn', which means a lake or a pool, possibly Brayford Pool, below the later city, and 'dun', a fort. It is possible that a date between 92-96 is more accurate for the founding of the colony, as the second citizen colony is founded at Glevum, in Dobunni territory, between 96-98. Lindum's colony is built over the evacuated legionary fort and is given a new set of walls almost straight away, no doubt a move designed to impress as well as to defend at a time in which few towns have walls. With the Fosse Way linking the forts of Isca Dumnoniarum in the territory of the Dumnonii with Lindum in Corieltavi territory, Ratae Corieltauvorum should be a rich, bustling settlement. However, until rebuilding work in the second century it remains poor and fairly down-at-heel. Now better quality houses with central courtyards replace many of the smaller ones, and although the central market place is not replaced, a forum is built nearby, along with a basilica and, by AD 145, a public baths. By the end of the century, or perhaps the beginning of the next one, the original stone walls around Lindum are augmented. They are increased in thickness and their height is raised to around seven or eight metres. In front of the walls is a massive twenty-five metre ditch. The work appears to be a progression from recent fortification work in the lower town, which continues into the fourth century. Decorated masonry from a fine building is used, either one demolished as part of an emergency measure or perhaps a disused pagan temple. The walls are slightly old-fashioned, as they fail to include semi-circular towers. Ratae is occupied by a detachment of Roman troops and it could be at this point that towers are added to the city's walls. Soon afterwards, the city is struck by a serious fire which destroys the forum, basilica and market hall, as well as a fair chunk of the centre of town. The buildings are never restored. However, in the countryside, villas continue to be maintained, with some in the region of Lindum receiving new mosaic pavements and even those in potentially vulnerable locations (Horkstow, Roxby, and Winterton) surviving late into the century, showing that there is little perceived threat from seaborne attacks here. Even so, the region appears to be militarised, and on a local scale rather than part of the general military zone of Northern Britain. A mass of locally-produced buckles suggests foederati, probably Germanic, but also with a Celtic movement, both in terms of belt buckles and local bands of militia, albeit not in large numbers. Brooches of the late fourth and early fifth centuries back this up. Three bishops of the British Church participate in the Roman Church's Council of Arles: Eborius of York (Brigantes territory), Restitutus of London, and Adelphius of Lincoln (Corieltavi territory) or possibly Colchester (Trinovantes territory). Given that York and London are leading positions in the material copied and expanded upon by Geoffrey of Monmouth, it is possible that these three bishops are the most senior members of the church in Britain. No other Roman-era sees are known for the country. Lindum has probably only recently become the capital of the new province of Britannia Secunda or Flavia Caesariensis (their order is uncertain) within the Diocese of the Britains, but this is also its last mention in history until AD 628. In the fifth century the area is seemingly part of a centrally-controlled Britain at first, for perhaps half a century following the Roman expulsion, and then as a territory with the possible name of Caer Lerion. The northern areas of the territory fall under the Northern British as part of the kingdom of Elmet. Early Saxon burials take place in the cemeteries, suggesting the same settlement here of mercenaries that happens in many other cities in the south and east. If Caer Lerion has any rulers of its own, they are unknown, and the region falls to the Middle Angles, certainly by AD 500 and perhaps earlier. The buildings of the eastern section of the Corieltavi territory, around the city of Lindum, are falling into decay, including the city itself. The Roman fort at Caistor is probably abandoned in the first quarter of the century, during the reign of Honorius, judging by the coin finds on the site. The last coins can be dated to about 402, with the buildings being abandoned perhaps half a century afterwards at most, as the remaining Romano-British society collapses and evaporates. Pottery ceases by about 450, although many of these 'Roman'-type pots are later used for Anglo-Saxon cremation burials at the site at Cleatham. Yarborough Camp is fortified in the late fourth or fifth century, using half-remembered Roman techniques, and it is clearly an important site, but the the region soon becomes dominated by the Lindisware.